Lunch Deals in Glasgow - Buddy’s BBQ New Brunch Menu! 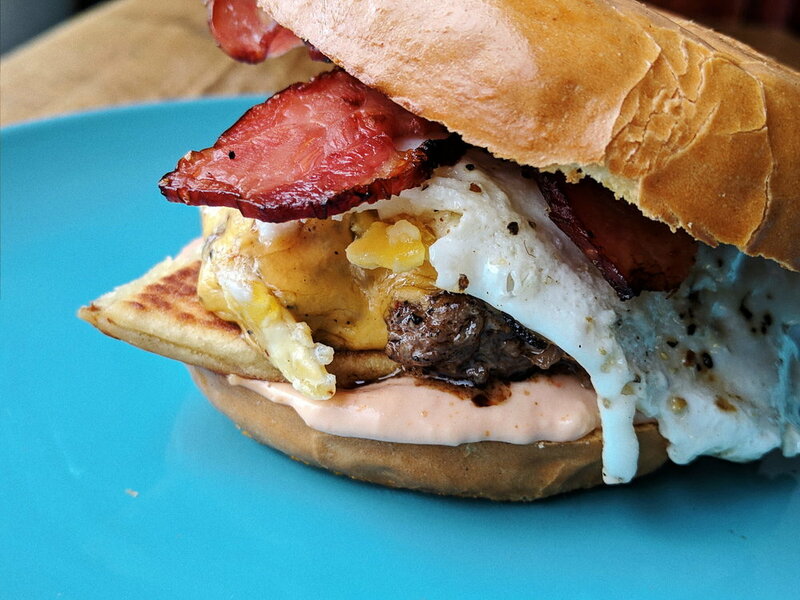 Our new Brunch Burger: cheeseburger, potato scone, fried egg and bacon on a bagel bun. One of the best restaurants in Glasgow just got even better! If you’re looking for one of the best places for lunch in Glasgow, come on down to Buddy’s in the city’s south side and discover our incredible new brunch menu - available between 12pm and late, Friday-Sunday. We’ve got fried chicken, we’ve got pancakes, we’ve got our signature BBQ burgers, we’ve got delicious chicken wings... we even have loaded baked potatoes! And just in case you’ve got room for dessert (there’s a separate stomach for desserts, you know), we have a selection of ice creams and shakes to choose from. Nothing too heavy, just the right amount of refreshment for a bangin’ lunch! Here’s a look at the full menu, and some mouthwatering images below to whet your appetite. Pancake stack with strawberries, bananas, and maple syrup. The Carolina baked potato poutine: pulled beef, spring onions and cheese curds. For vegan friendly restaurants, Glasgow has some really cool options, and we’ve made sure our new menu includes some of our most popular vegan and halal options, so there really is something for everyone. If you have any other food allergies or intolerances, let our staff know and we’ll make sure you still receive the full mouth-watering Buddy’s BBQ experience! If you’re looking for BYOB restaurants in Glasgow, at Buddy’s you’re more than welcome to bring along your own bottle (beer and wine only, please, we’re not total savages) to enjoy with your meal, so check out our menu! We’ve also teamed up with The Gym Glasgow South; members can enjoy 20% off your sit-in meal here at Buddy’s. And just in case you have a real love for all things extreme, we have one of the best (and intense) Food Challenges in Glasgow: Buddy’s Hot Wing Challenge! This is a challenge SO hot, you need to sign a waiver before taking part - but what’s a bit of pain and suffering between friends, right? Make sure you follow us on Facebook, Instagram & Twitter to keep up to date with all the latest deals and specials including our incredibly popular European football night take-out discounts, the perfect way to enjoy the ‘fitba’ at home!